Printing invoices, shipping bills, bar code labels and reports can impact the bottom line. At 540 cps 415 pages per hour ith workloads to 16,000 pages per month the T2145 and T2245 are ideal for tough, transaction printing. The T2145/T2245 can be configured optionally with three input tractors. A standard front push tractor and straight paper path load up to 6-part forms with zero tear-off for zero waste, zero skewing and zero jams. A second front tractor and a rear tractor may be added. From the small 80-column footprint of the T2145 to the 136-column capacity of the T2245 their rugged design and quiet <53dB(A) operation equip them for the warehouse, the shipping dock or the front desk. 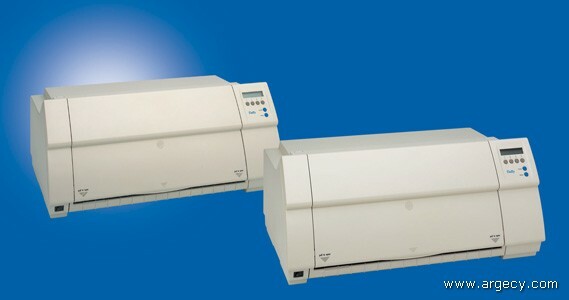 Back-room durability combined with front-office 24-wire print quality and a variety of automated performance features make the T2145/T2245 a serious solution for demand document printing. Paper Width Std: Front tractor and manual front insertion (cut sheets) T2145: 3-10"; T2245: 3-16.5"
Physical (W x H x D) T2145: 16.7" x 11.8" x 15.7"; 29 lbs. T2245: 23.6" x 11.8" x 15.7"; 35 lbs.